Moth Physical Theatre was founded in 2016 by physical actors Chelsey Lee, Amber-Rose Perry, Charlotte Irwin and Emma Crowley-Bennett. All of the members of Moth are physically trained actors and theatre-makers who are graduates from the BA Physical Theatre course at East 15 Acting School. 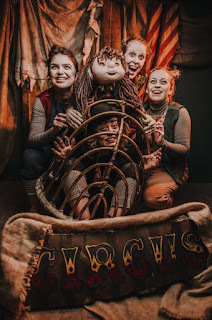 They pride ourselves in creating visually stimulating theatre using physical storytelling, movement, puppetry, music and light. Their aim is to bridge the gap between education and the industry. They understand how difficult it can be to find work, therefore our mission is to teach, inspire and guide others is how to create their own. The company member's most recent credits include working with Les Enfants Terribles, BBC ONE, BBC THREE, Tangled Feet, David Glass Ensemble, Frantic Assembly, Brunskill and Grimes, Tall Stories and The Outbound Project. "Our tale tells of a little girl and Wilma was her name, who loved to laugh and run and play, more wild and free than tame!" Wild Wilma tells the story of a young girl who is sold to the circus after the death of her parents. Wilma struggles to fit in and meet the strict expectations of the circus mistress. On a quest to find her identity, Wilma finds the courage and bravery to be wild and free through the friendship of others. A wonderfully wild new family show written by children's author, Rachel Lyon (I Wish I'd Be Born A Unicorn for CBeebies) suitable for ages 4+ told through physical storytelling, puppetry and an original soundtrack. Be brave. Be different. Be wild! So far, Wild Wilma has won the East 15 Graduate Companies Award, Tangled Feet Mentorship Programme and was a finalist in the 2018 LET Awards and we are currently in talks and being helped by James Seager, the producer of Les Enfants Terribles. Running Time: 45 mins plus time to meet the puppets at the end!